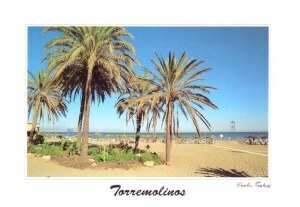 Torremolinos is a municipality on the Costa del Sol of the Mediterranean, immediately to the west of the city of Málaga, in the province of Málaga in the autonomous community of Andalusia in southern Spain. It belongs to the comarca of Costa del Sol Occidental. A poor fishing village before the growth in tourism beginning in the late 1950s, Torremolinos was the first of the Costa del Sol resorts to develop.